Measure from the top of your transom to the bottom of your keel. If it is from 15" to 17" long you'll need to get a Parsun outboards with a "short" shaft. If it is from 20" to 22" long you'll need our "long" shaft outboard. Parsun outboards shafts are measured from the bottom of the engine mounting bracket to the cavitation plate on the lower unit. Generally most boats need either a short or long shaft although some boats require a 25" shaft (ultra-long shaft) outboard. 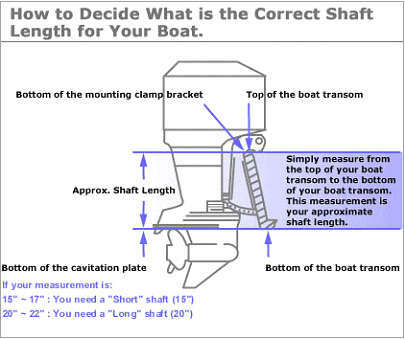 We recommend that you consult with your local dealer to determine which is the correct shaft length for your particular boat. Now we supply two kinds transom height for outboards. The follow draw had explained the transom height in detail.